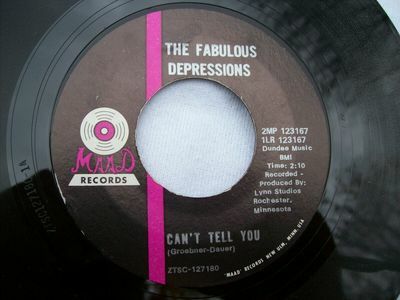 Fabulous Depressions--Can't Tell You / One By One--MAAD. Great 1967 garage two-sider by this Midwestern band. B-side is a cover of a Blues Magoos tune. Disc is a strong VG with high gloss and scattered light marks. There is a promotional stcker on the B-side; otherwise the labels are clean.